True to size with nice knit in fine gauge. The flowers are a bit stiff, but very pretty. 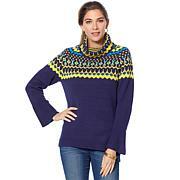 Nice sweater to wear inside and fit under your coat for winter. This is my first purchase from Jamie Gries' line. I ordered this sweater duster in white for Holiday pictures, and it is really pretty! It is lightweight and can easily be worn with a turtleneck or a silky blouse. The tunic length is a great look and the overall fit is true to size! I got the black one and the design and flowers are gorgeous. However, I feel for the quality it is a bit on high price side and should have been lower.